Stir fry is the quickest thing to cook when you're hungry with little culinary imagination + a load of wilty vegetables on the cusp of death in the back of the fridge, chopped and thrown in, and sauteed lightly for the same length of time it takes to cook the accompaniment grain or noodles, and Bob's your uncle. The secret really comes in the sauce you finish it with. The dish can also be made with meat for the carnivorous consumers (chicken goes best), or for the vegetarians add grilled tofu. Use any and all of the following, but start by fat slicing onions into quarters or eighths, sautee lightly with small nub of peeled and grated ginger, chopped garlic (2-4 cloves) and a tsp. of crushed mustard seeds, in olive oil and dollop of sesame seed oil. 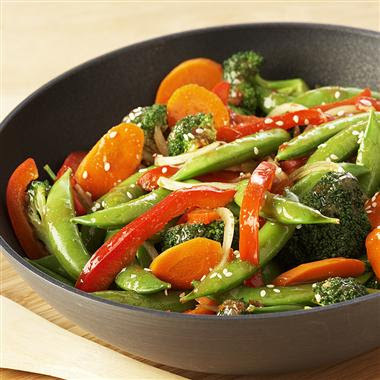 Thinly-sliced carrots & turnips & courgettes & beans (string/green/snow) bell pepper(s) (red and yellow, for taste and flavor), broccoli/beets/eggplant (cut into small-ish chunks), asparagus (chopped), and anything else you've got, prepared for chopstick consumption. Cook about 10-15 mins. I usually start low/medium heat and turn up the temp. after 10 mins. adding 1-2 cups bok choy &/o spinach &/o kale to cook for about another 5-10 mins. Water chestnuts or bean sprouts add a nice crunch, you can add alongside the leafy greens. Turn off pan & set aside to cool. 1/4 - 1/3 cup soy sauce (I use a wheat-free tamari sauce - I'm not normally one to plug products but San Jay makes a good low-sodium version). Mix together all the above using a fork. Turn on high heat the veg in the pan. Add the sauce and a palm-full of nuts/seeds (pine or sesame give the nicest flavor, but almonds or peanuts work too), sautee for about 3-5 mins., still on high, until all the veg are coated and the pan begins to dry and stick. Enjoy in combination with rice noodles, rice itself boiled fried or steamed, or quinoa. hey, nice one on the day-after-bday post. are turnips good in a stirfry? i don't think i've ever cooked them myself.